The U.S. is the only country operating in the region known to have the ability to launch missiles from drones. Peshawar, Pakistan (CNN) -- Four people in Pakistan died Saturday when a suspected U.S. drone fired two missiles at a target close to the Afghan border, according to two intelligence sources and an administration official. The drone struck a compound in the village of Ismail Khan in the Dattakhel area of North Waziristan, a volatile region in Pakistan's tribal area where Islamic militants have a strong presence. Dattakhel has been the center of many recent drone attacks, and this strike is the latest in a series of such actions in the rugged territory. The sources say foreigners may have been among the fatalities. 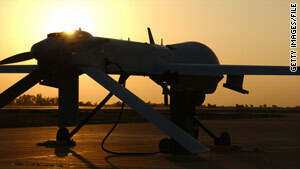 The U.S. military routinely offers no comment on reported attacks by drones, or unmanned aircraft. But the United States is the only country operating in the region known to have the ability to launch missiles from remote-controlled aircraft.